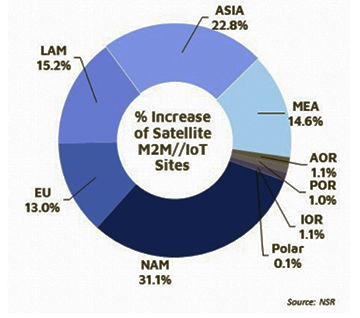 The ninth edition of NSR’s M2M and IoT via Satellite (M2M9) report expands on previous editions with more applications than ever before — now a record 23 distinct applications, with full 10-year forecasts for aeronautical (general aviation and rotor wing sub-segment), and intelligent transport systems through to 2027. In addition, the much sought-after small satellite segment is now forecasted across major applications and in all regions, drawing from NSR’s vast library of research. 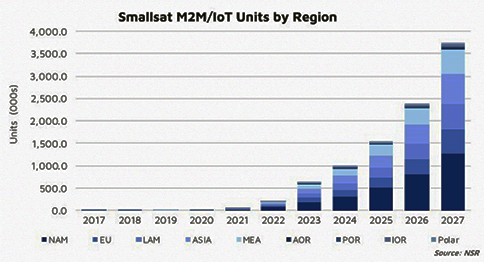 This will allow the reader for the first time to assess how much demand smallsat IoT will generate, what the impact will be on the overall market, and how companies should position themselves competitively. 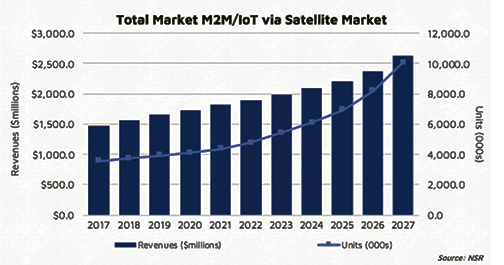 This report allows clients to gain deep insight into the continuously expanding and evolving M2M and IoT sectors, permitting companies to devote focus to growth opportunities and to set expectations on a per application basis. This industry reference clarifies which applications will see the strongest and weakest revenue growth, unit demand trends and the shifts in ARPUs over the next decade. Readers will find that market opportunities and sizing come derived from a multitude of real data, producing level-headed actionable insights without the hype too commonly seen with IoT and small satellite constellations. The insight gained from M2M9 will enable decision makers to create informed long-term business strategies, present partnership opportunities, and to align business development with future regional and global trends.